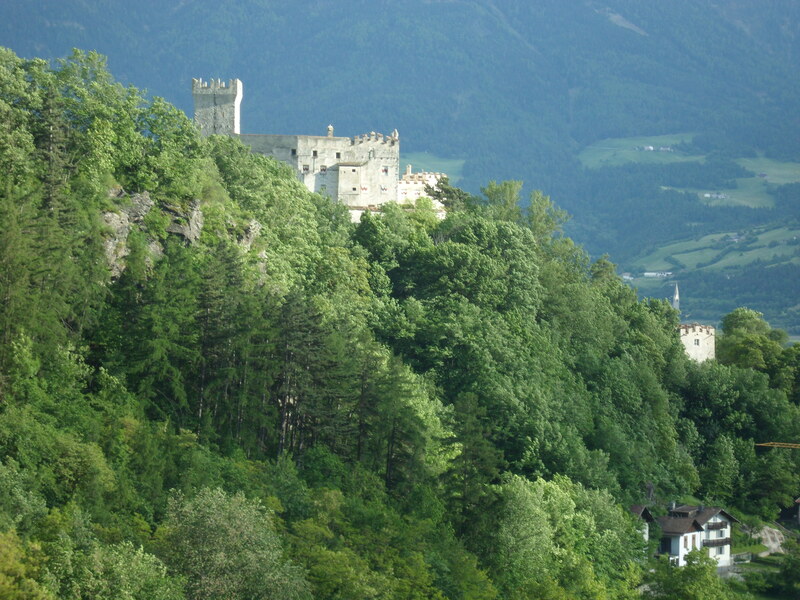 Schloss Churburg as seen from a third-story balcony outside the walls of Glorenza. Photo by Sean Manning. Most weeks I post about things which I have seen or read myself, about domains in which I have reason to consider myself an expert, and refer to supporting evidence which my gentle readers can check if they doubt me. This is a kind of history which began to take shape in the eighteenth and nineteenth centuries along with other kinds of modern science. It is certainly not the only way to tell stories about the past. So this week I decided to try something more Herodotean. What I will tell you this week comes from people met here and things read there, and I think that it tells something important, but in the end it is still a story about things long ago and far away, and just because it is great fun does not mean that every detail is true. This is the story of how the Grafs Trapp acquired Schloss Churburg and the armour of the Vogts of Matsch. Cast your mind back to the thirteenth century, an age of robber-knights and of conflicts for authority amongst kings, princes, communes, and bishops. 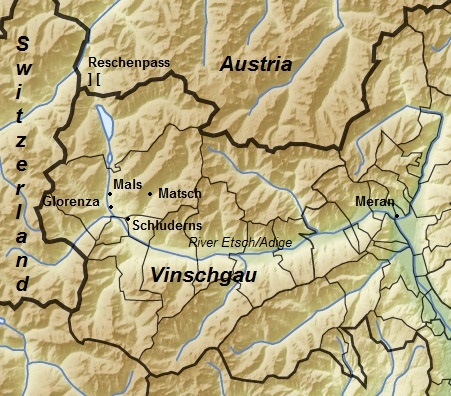 The Vinschgau was contested between the Bishops of Chur to the west (well inside modern Switzerland and so beyond the left edge of this map) and the Counts of Tyrol with their castle over Meran to the east. Since the Roman improvements to the Brenner Pass had long decayed, the Reschenpass was the best road over the Alps in the area. 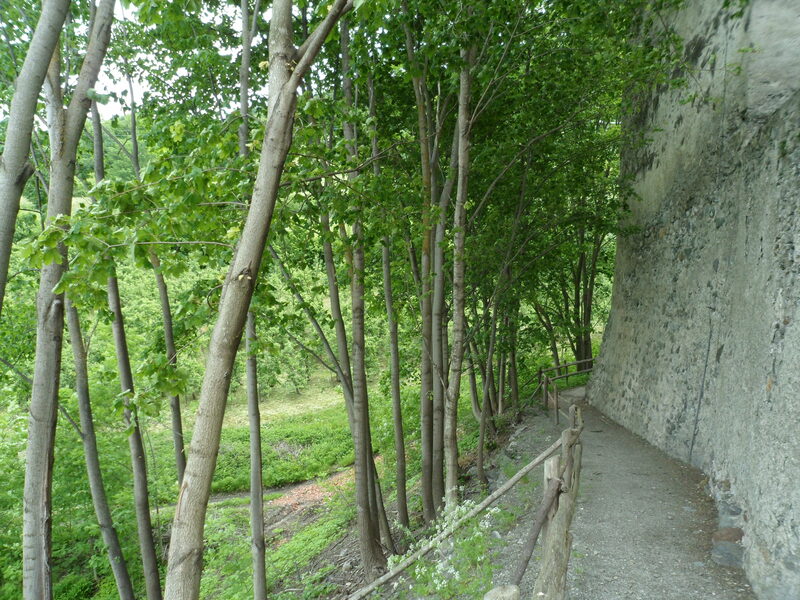 Over that road was a narrow valley, and in that valley was the village of Matsch, and that village had a male line of lords who took their names from it. Their arms were three blue eagle’s wings upon a field of white. It was the fancy of those lords to ride out upon the road with their households in arms. And so on the hills above the mouth of the Matscher Tal and the village of Schluderns Heinrich von Montfort, bishop of Chur, built a fortress and called it Churburg, which means Chur Castle in their tongue. The villagers tell me that Churburg is first mentioned in a document in the year 1259. It is curious to report that when Churburg next appears in the archives, in 1297, it was in the hands of the second Ulrich von Matsch. Yet it is not in nature for prosperity to abide long in one place, nor for a family of hard men and robbers to become soft and docile in a single generation. Ulrich’s sons devoted themselves to fratricidal strife, and it came to pass that in the year 1348 the third Ulrich von Matsch was forced to commend himself to Ludwig von Brandenburg, Count of Tyrol, as a vassal. The arms of this count were a red chevron inverted upon a field of white. 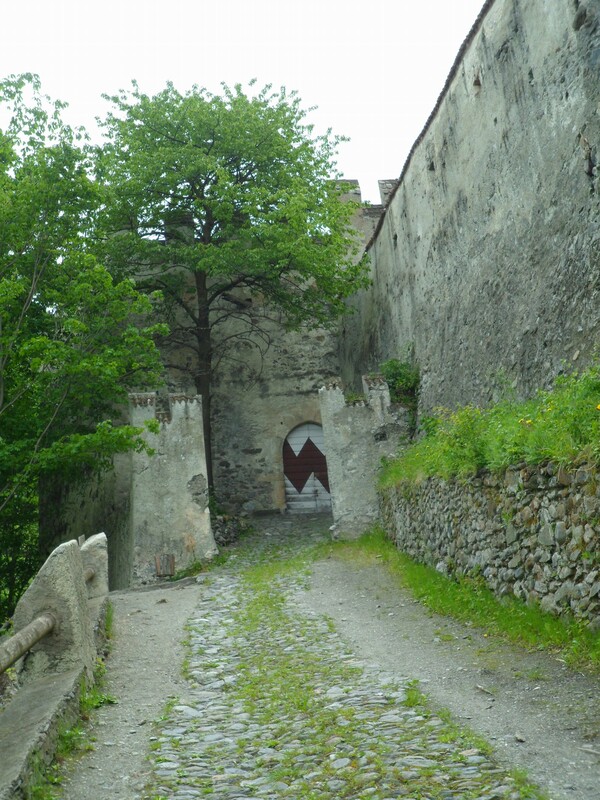 One of the side gates to Schloss Churburg, painted with the Trapp arms which are similar to those of the counts of Tyrol. Photo by Sean Manning. After that the lords of Matsch flourished for three long generations. Several of them became captains of the land of Tyrol, a position of great honour amongst their people. They enlarged their castle at Churburg. The fourth Ulrich von Matsch had a wedding, and about it certain of the Italians tell many stories which I will not recount here. Yet in the year 1504 Gaudenz von Matsch died without a male heir, and the male line of the Vogts of Matsch came to an end. Gaudenz von Matsch had a sister by the name of Barbara, and this sister had sons by the fourth Jakob Trapp. The Trapps were a Styrian family, and Jakob had come to the court of Sigismund Rich-in-Coin and died wealthy and respected with three living sons. But Gaudenz also had a son-in-law called Erhard von Polheim. According to the custom of the country Churburg was divided in two and inherited equally by Erhard and by Barbara’s sons, and for thirty years there was great strife before the judges, for the Austrian nobles rejoiced in lawsuits almost as much as the Athenians. In the year 1541 the Trapps were awarded the whole of Schloss Churburg with its keep and its archives and its armoury. 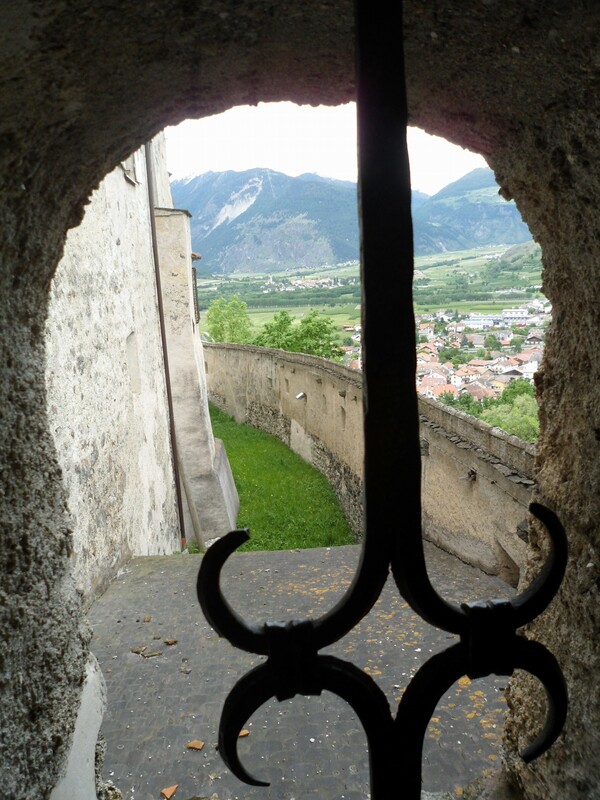 Although they followed the court, which in those days was in Innsbruck over the Reschenpass and down the Inn, the villagers say that they always rejoiced to visit Churburg in the summer, and there they built arcades and a study and a garden. I myself noticed how they also built their castle so that all the outer walls have loopholed walkways running along them and projecting bastions at the angles, with one wall or terrace overlooking those below, and that they would have clear fields of fire in all directions if they cut down the young trees, but I have a low and suspicious mind. Anyways, that is the story of how the Grafs Trapp acquired the armoury of the Vogts of Matsch. What you make of it, gentle reader, is up to you.